Alice, dear Alice. 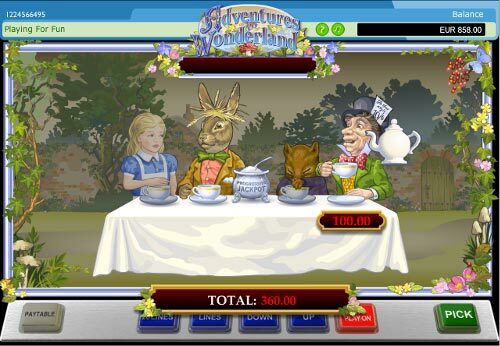 The story of magic experiences goes on with Adventures in Wonderland Slot Machine and our favorite characters. No matter how old we are, everyone loves the fairy tale, which represents our inner feelings. So, let us jump into the Playtech world and see who we can meet on our unstable way. All the heroes are waiting for you among the 20 lines. You can meet anyone, just enter the wood and the whole stream of actions will change. Benefits of this no download journey start right at the entry, when you spin the 5 reels and see how bonus games get activated. Yeah, everything is as simple as that. 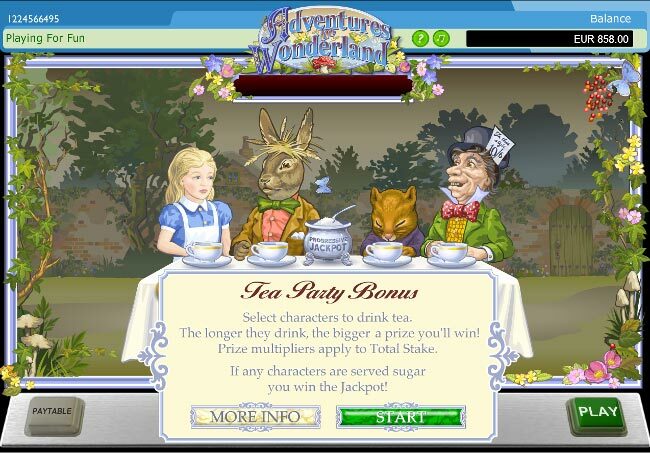 Have a cup of delicious tea with 3 icons of the Mad Hatter and enter the Tea Party Bonus Game. There you will see all the heroes and pick which one to serve. Keep on selecting guests as long as they had their fill. Each of them awards you with a cash prize, so the better you treat them, the higher amounts they will give you in the end. Keep an eye on the middle reel. Once you notice a Rabbit Hole icon on the 3rd reel, the Rabbit Hole Bonus gets triggered. Our lovely Alice will fall down collecting the rewards. The chain of luck ends as soon as she lands, that is when, you will see the total sum of the gains won. Follow 3 icons of the While Rabbit and it will take you to another feature. 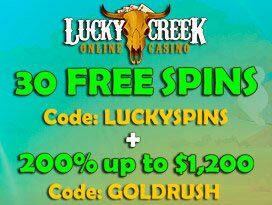 Spinning the hand, you can win up to 20 Free Spins. After that the Rabbit is going to jump over the reels, no matter where he lands, the position will be covered with sticky wilds for the whole bonus game. Being the main hero of the story, no one but Alice could be the wild symbol, right? Only she replaces the other ordinary icons and helps them complete the combinations, making each of them a winning one. Huh, such crazy things can happen to you here. Let’s move further, what do you see there? As we have talked about the numerous bonuses, you could have marked that there are no less than 3 scatter symbols. Both White Rabbit, Mad Hatter and Rabbit Hole pay anywhere they land. Jeepers, with such a diversity of high limit slot games, you are poor, because it’s really hard to choose a way to explore. Wherever you go, all the roads will bring you to making stakes. Coin values vary from $0.02 up to $10, is that okay for you? Anyway, you can pick the size to suit your taste. There’s no option for putting several coins per line, and, that is why, increasing it to the maximum, we have a $200 bet for each twist, in the end. You have a chance to hit the top jackpot. Why not take advantage of the situation? 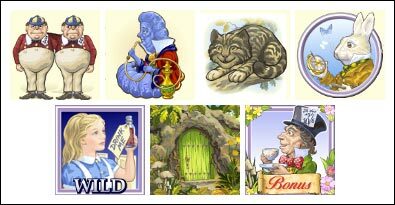 The only thing required is collecting 5 icons of Alice and watch them create a line of your future winnings. That time you become richer for $100,000 with no extra effort. Being in the middle of the Tea Party Bonus, see after the spoon in the sugar bowl. 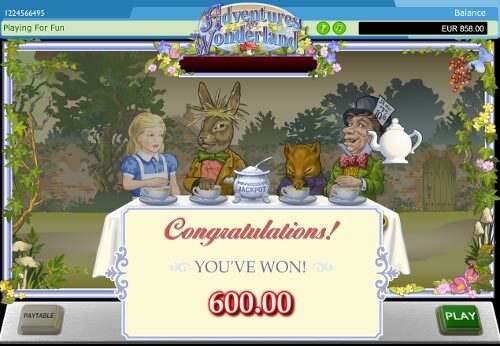 As soon as any guest wants to sweeten the tea, you win the Progressive Jackpot. Now the feature becomes more desirable, huh? The Mad Hatter can turn your world upside down. 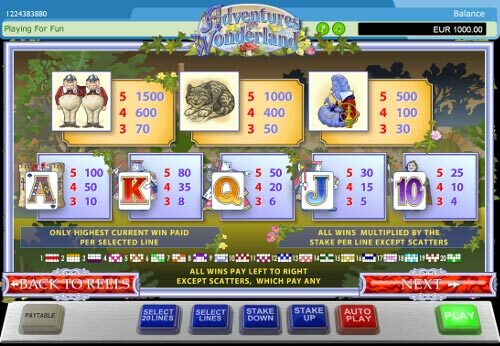 Join the great Adventures in Wonderland Slot Machine and check on your own what a real fun is. 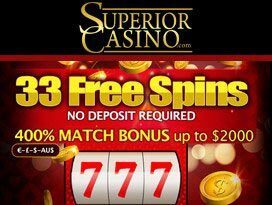 The numerous bonuses won’t let you get bored even for a while. 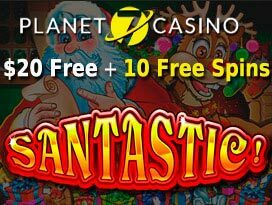 Go and load the game now to be the first who grasps the progressive jackpot.